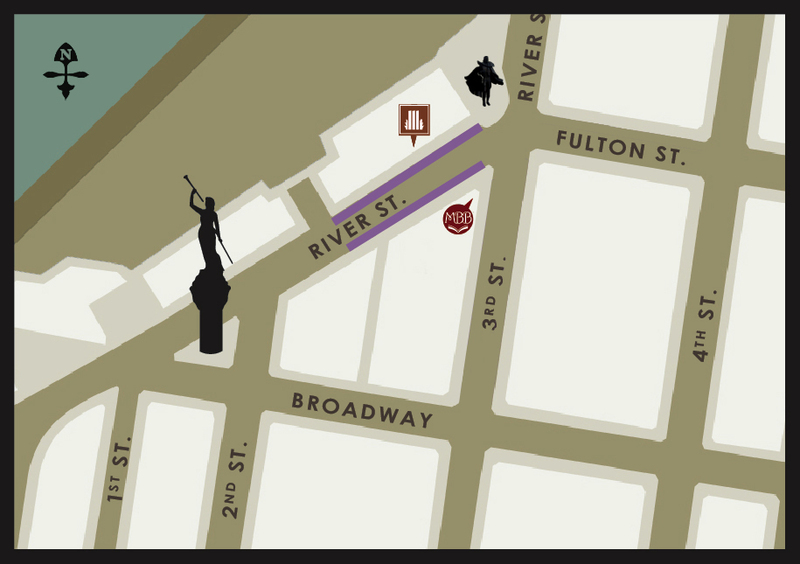 We are now located at 291 River Street – Suite 180, just across the street from Market Block Books on River Street. We’re about a block South of the Green Island Bridge / Dinosaur BBQ, and a block North of the Arts Center of the Capital Region / Monument Square. We suggest parking in the purple areas highlighted in the map below. The area directly in front of the entrance to our office is a loading zone – bad for parking, great for picking up your books! Take 787 North to exit 8 (Watervliet/Green Island). At the end of the exit ramp you will come to a light; make a right. Continue about .25 miles to the next light, make a right to cross the Green Island Bridge. After you cross the bridge, you come to a light – make a right onto River Street. Continue one block, and make another right at the light.This will keep you on River Street. We are on the right. You can park on the street, some spots are free, some are paid, please read the signs. There is also a paid parking lot on the right, just past our office. 291 River Street is a large building with wooden doors, enter through the wooden doors and make a left before the stairs. Walk past the elevator, and follow the hallway to the back of the building (we have a great view of the river!). Take the Mass-Pike (I-90 West) toward New York/Albany. Continue on I-90 West when you reach New York. Take exit B1 toward RT-9/ ALBANY/HUDSON. Continue on I-90 West for 14 miles. Take the exit for 787 North toward TROY. Continue about 5 miles until exit 8, then follow directions above.